Homebaked hostess gift packages filled the kitchen countertops this week, some plates ready to be delivered to friends and neighbors and other baskets destined to travel to holiday dinners or parties. Pretty bows added some color to the more neutral golden browns and beiges of sweet and savory treats. Mmmmmm, the pungent scent of curry, cumin and garlic filled the kitchen while the spiced nuts roasted, and that aroma did linger on for a few hours afterward. Sweet citrus, vanilla and almond fragrances perfumed the air on morning after morning as an assortment of butter-rich cookies cooled on stacked racks. Cheese crisps, cheese straws and cheese wafers added their own distinctive tang as they took their turn in the oven. There was such a noisy mix! Open with the whirring rumble of the Kitchen Aid mixer, add the intermittent chop, chop, chopping of knives mincing nuts and dried fruits, dial in some Christmas carols as background music , and add endless teasing and peals of laughter as I baked and RL nibbled on raw cookie dough and sampled more than a few finished treats. Use a stand mixer or food processor to make take all of the effort out of this recipe - or work a little harder and do it by hand with a pastry blender. Add the shredded, room temperature cheddar to the mixer bowl; Whirl it around to cream it. Add the diced, softened butter to the bowl and cream it with the cheese. Add the flour, salt, smokey paprika and minced onions (or bacon) to the bowl and mix well until the dough comes together into a ball. If it seems too dry and crumbly, add a tiny bit of milk or cream and keep mixing until a rough ball forms. Preheat the oven to 350°F. Line baking sheet pans with parchment paper or use a Silpat. Sprinkle lightly with salt and smokey paprika and bake until golden and crisp, about 10 to 14 minutes. Let the cheese wafers rest on the baking sheet for a minute before transferring them to cooling racks. Cheddar Wafer dough is stiff and not at all pretty. 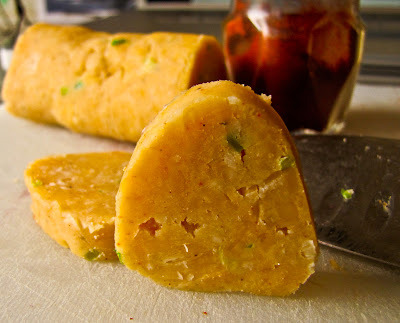 A chilled roll of dough cuts easily into uniform slices. Stacked racks of Cheddar Wafers are irresistible and invite immediate sampling. Oh yum, this bread is beyond delicious, it's downright addictive. How else can I explain slice after slice of a warm 1/2 pound boule disappearing before supper? With full stomachs we let it substitute for our evening meal on baking day. A second rustic loaf, sliced and lightly toasted, filled in as breakfast for two the next morning. We really needed to slow down, stop after one slice, or switch to elastic waistband jeans... but there were two more of those tempting loaves left. I fell in love with this dried cherry/lemon combination when we stopped for lunch on a roadtrip through Skagit County. We shared scrumptious orders of breaded oysters and oyster shooters at the Longhorn Saloon, a biker bar in Bow, Washington, but it was the visit to the nearby BreadFarm bakery that made my day. Display cases and counters featured trays of tempting cookies and breads. Thank goodness I took the suggestion of a helpful baker and chose the large loaf of Sour Cherry Lemon Bread (and an assortment of cookies). I planned to sample the bread at home that evening, but my willpower failed me. Who could resist the aroma of fresh bread? not me. We stopped at friends to visit and share the cookies, and eventually I cut a few thin slices off the bread round for us to sample. Instant hit! 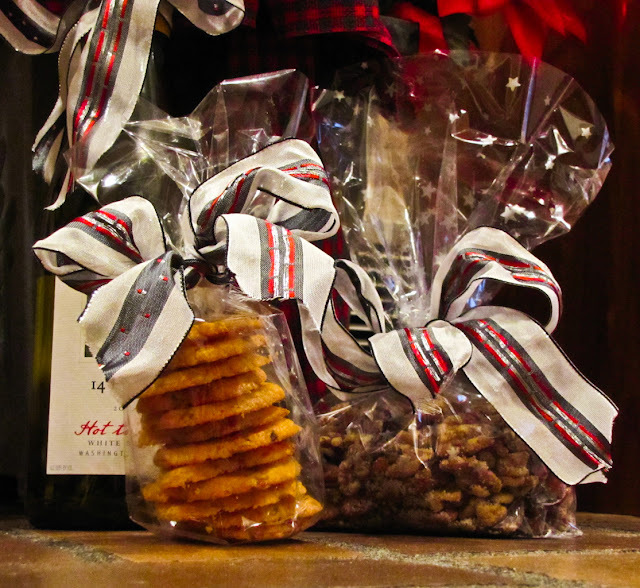 we nibbled out way through the cookies and could have polished off all of the bread too. Instead I tucked the remaining half loaf inside a paper bag and stashed it back in the car. I still planned to enjoy that bread at home, truly I did. That didn't happen; nope, we tore off small chunks and ate the whole thing on the two-hour drive back to Seattle. Have you noted my breadaholic tendencies here? Batch #1: I added dried sour cherries and lemon zest to my standard recipe for No Knead Sourdough Bread (link). It was good, but not quite lemony enough. Batch #2 featured the dried sour cherries plumped in lemon juice, drained and then added to a new sourdough recipe along with the zest of one lemon and a handful of chopped pecans. Mmmmmm, delicious. This batch was closer to the remembered flavors of the Edison Breadfarm loaf, but the crumb was a smidge heavy. Too much flour? maybe too thick a starter? Any issues here were with the baker, not the recipe. 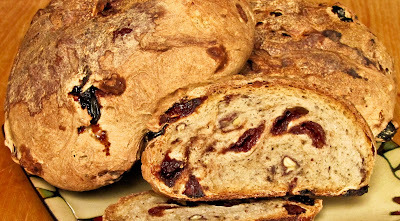 In Batch #3 I ignored the sourdough factor altogether and used soaked cherries, lemon juice and lemon zest along with a standard white bread recipe. Still good! I think I'm on to something here. We love this bread for morning toast or as an afternoon snack - warmed,naked and subtle in its lemonyness, or warmed and slathered with butter or cream cheese. 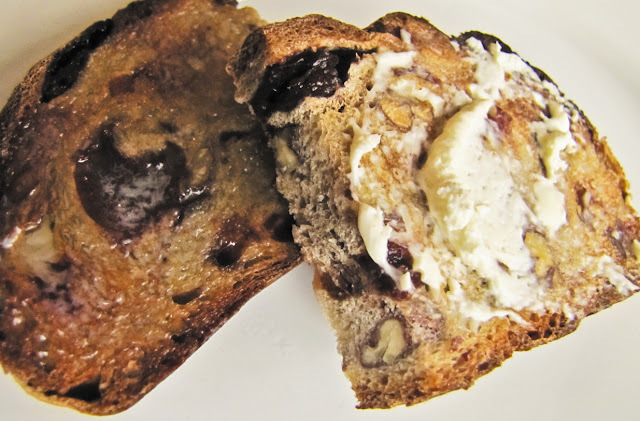 It makes an awesome base for a sweet bread pudding, but that's a topic for anther post. Sour Cherry Lemon Bread just might replace Walnut Rosemary Sourdough as my absolute favorite bread. Try adding dried sour cherries, lemon zest and nuts to your favorite bread recipe - you'll love it. Just remember, it could be habit-forming. Use a zester to remove the zest of 1 lemon; set aside. Soak the dried cherries in lemon juice until they plump up; drain set aside discarding the lemon juice or use it for another purpose. Pour the active sourdough starter into a mixing bowl. Add all of the other ingredients except the flour and mix well. Add the flour one cup at a time until it's too stiff to mix by hand. Turn out onto a floured board and knead in the remaining flour as needed until the dough is smooth and shiny. OR use your stand mixer and bread hook. 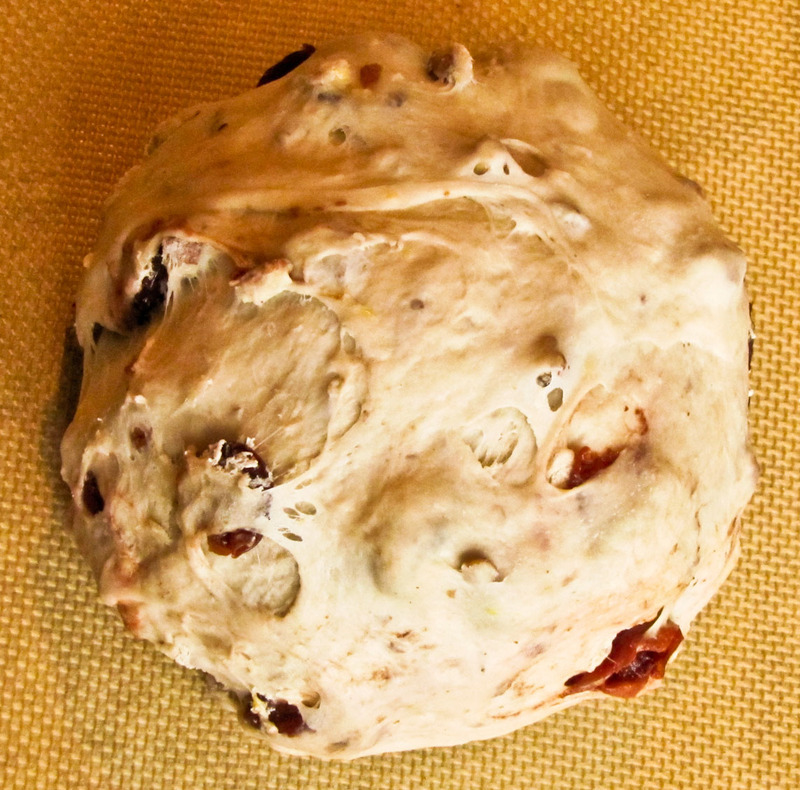 Place the dough in a large bowl, cover with plastic wrap and let it proof overnight 8 to 12 hours at room temperature. The dough should double in size. Use a bread scraper or rubber spatula to gently ease the dough onto a floured board. Allow to rest for 30 minutes. If the dough flattens markedly, knead in additional flour before shaping your loaves. Following the 30-minute rest, it's time to divide the dough in half (or fourths, etc.) and shape it. 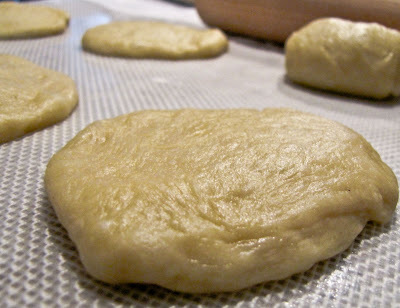 Take a portion of the dough and flatten it slightly; lift a portion from the edge, pull and fold toward the center. Continue this lifting and pulling around the dough to form a rough ball. Pat and pull into the desired loaf shape. Repeat with the remaining lump(s) of dough. Place the shaped dough on a baking sheet or in bread pans and proof for 2 to 4 hours, until double in bulk. Place the baking sheet or pans in a cool oven; set the temperature to 375 F and bake for 70 minutes (or until browned and 185-190 F internal temperature). Remove the loaves from the sheet or pans; cool on a wire rack for at least 20 minutes before slicing... if you can wait that long. We eat this bread almost as fast as it comes out of the oven, but an occasional small boule has lasted as long as a week and still been quite tasty though a little bit drier. What do you do with leftover cooked chicken? or even deli roasted chicken? I welcome it to use in enchiladas, tortilla soup, filled crepes, quiche, chopped salad, sandwiches, quesadillas, etc. 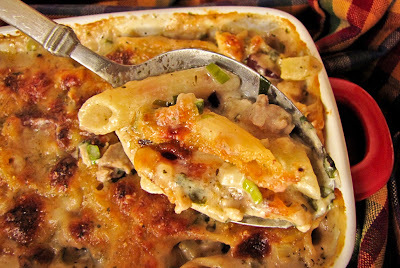 Today, along with a handful of ordinary pantry ingredients, shredded chicken transformed a mac 'n cheese casserole into a zippy, company-worthy entree. Not that I'm having much casual dinner company the week before Christmas, but it's nice to note for feeding impromptu guests in the future. 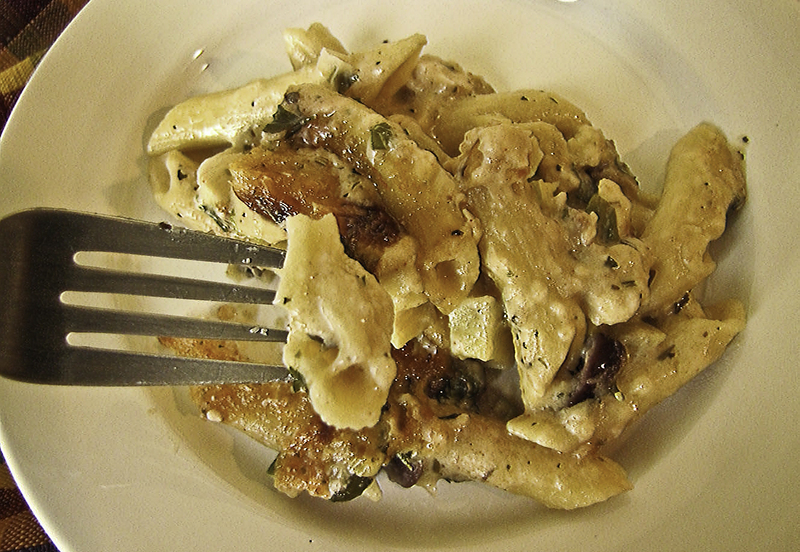 This penne dish featured mozzarella and parmesan cheeses melted into a smooth bechamel (white) sauce flavored with Italian herbs, chipotle and garlic. Chopped artichoke bottoms, capers, kalamata olives, green onions and Italian parsley nestled alongside the chicken pieces to add both flavor and crunch to the dish, providing a snappy bite that balanced the richness of the sauce. I will eat almost any version of pasta with cheese sauce and love it, (well, maybe not blue cheese) but today's recipe offered an especially savory combination of flavors. I'm still smiling 'cuz there's just a little bit left, a snack for me to enjoy late tonight or for breakfast tomorrow. Preheat the oven to 375 F. Spray or butter a small baking dish or casserole. Grab a heavy skillet and melt the butter with the olive oil over medium heat. Add the garlic, herbs and seasonings, stirring constantly for 2 or 3 minutes until fragrant. Be careful not to burn the garlic. Sprinkle the flour over the top; use a wooden spoon to mix it in thoroughly; cook for a minute or two, stirring constantly. 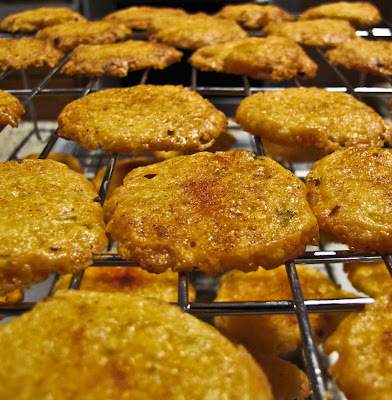 Add the milk and whisk it in vigorously to incorporate and eliminate lumps. Bring the mixture to a simmer and cook, stirring occasionally until thickened. Aim for a loose sauce, not a paste, so add milk as needed. Season with salt and pepper to taste. In a large bowl (or the skillet if it’s big enough) mix the sauce and pasta. Use a spatula to fold in the olives, artichokes, onions, capers, parsley, mozzarella and half of the Parmesan until evenly coated and well combined. Turn the mixture into the prepared dish and sprinkle the remaining Parmesan and some breadcrumbs on top. Bake in the middle of a 375 F oven for half an hour until the cheese is bubbling and the top begins to brown. This served 2 for a light supper, but a really hearty appetite could consider this a single serving. It's surprising when one word triggers an unexpected flood of memories, snatches of forgotten conversations, a slide show of images... scenes from the past. Bao was a trigger word for me. These buns are infrequent treats in my everyday life, so the December Bao Challenge brought a poignant flashback to adventures with a special friend. Colleen, an experienced downtown shopper, guided our long ago excursions through Seattle's International District. I can almost smell the odd, intriguing fragrances of crowded counters in the old Uwajimaya, and the tempting aromas wafting out of countless restaurant kitchens. Through closed eyes I can still see flocks of brilliant neon-orange BBQ ducks hanging in shop windows; pan after pan of bao and other treats displayed in bakery cases on King Street; stacked crates of intriguing produce. A background murmur of unfamiliar languages swirled around us as we roamed and shopped. Today eye-riveting color comes from a dozen 20-foot dragons that curl around lampposts in the district: years ago it seems there was a kaleidoscope of color everywhere. Sigh! this recent bao activity was a tamer, less colorful adventure without the enthusiastic presence of Colleen. The Char Sui, aka BBQ pork, was a major hit with my taste tester. Left undefended, it might have disappeared quickly as RL filched a slice or two each time he strolled through the kitchen. Just doing a quality check, right? I set out the typical Chinese restaurant small dishes of red sauce, hot mustard and sesame seeds alongside a plate of sliced pork for snacking purposes. It worked, those slices disappeared quickly and helped to keep both of us away from that cooling bowl of prepared, chopped filling. The Cantonese BBQ pork, all by itself, was a major success. My filling/wrapping technique needs work to balance the ratio of filling to dough. Several buns were eaten for the filling with the dough discarded. 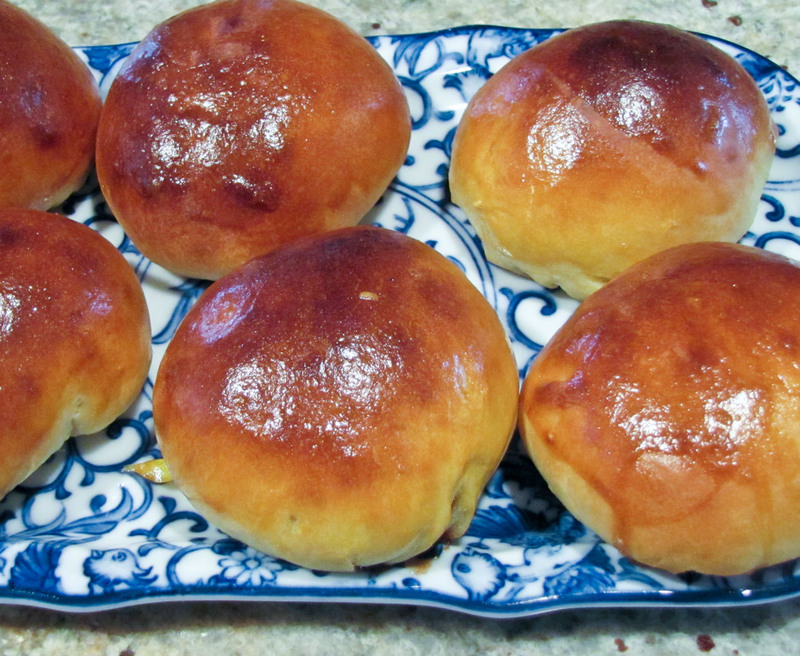 These bao were too breadlike and overcooked by a minute or two. Steaming would produce a softer, fluffier texture. I'll try steaming next time. Asian bakeries needn't fear any bao competition from my kitchen, not this week. 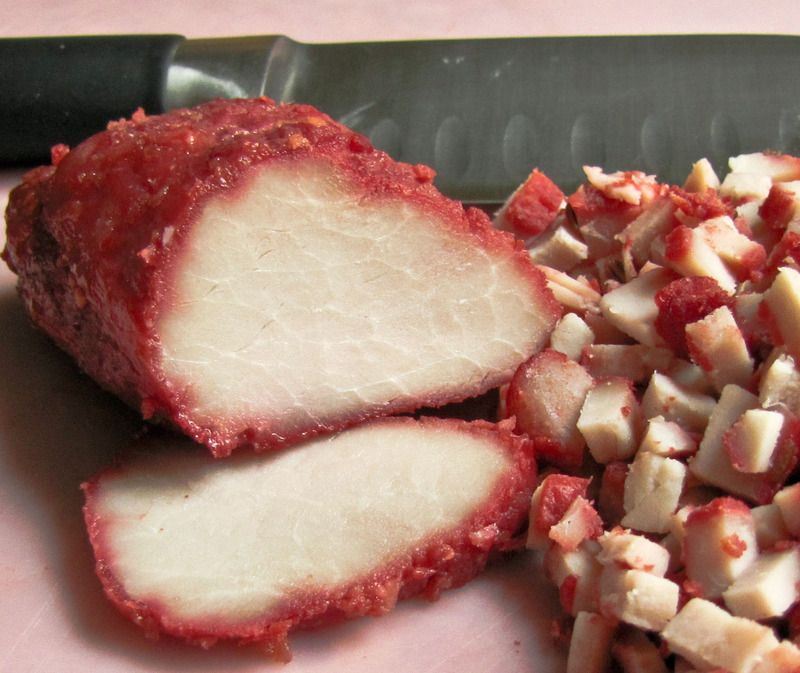 Put the pork strips in a medium glass or ceramic bowl (a ziplok bag works well too). Put the brown sugar in a small bowl, add the hot water and stir until the sugar dissolves. Add the remaining ingredients. Set aside to cool slightly, then pour 2/3 of the liquid over the pork. Reserve the remaining liquid to baste the pork during cooking. Turn the pork over a few times to coat it evenly with the marinade. Refrigerate 8 hours or overnight, turning over several times during this period. Lift the pork from the liquid, allowing the excess to drain off. Line a baking sheet with foil - don't skip this step or you will never get the caramelized sugar off of the sheet! Put a metal rack on top of the foil. Place the pork on the rack and place in the oven on a middle shelf. Bake for 10 minutes, basting and turning occasionally. Raise the oven heat to 400 F and cook an additional 20 minutes, until cooked through. 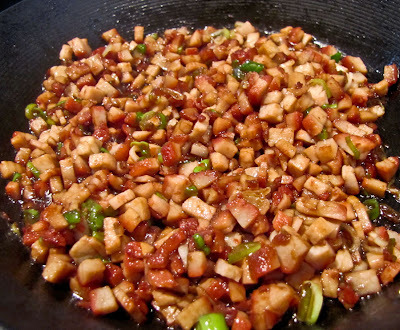 Add diced pork to the pan; stir and add green onions and cook for 1 minute. 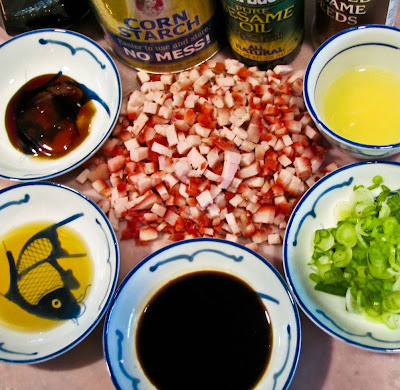 Add soy sauce and sesame oil to the pork mixture; stir fry for 1 minute. Mix cornstarch and chicken stock together until cornstarch dissolves; add to the pork mixture. Stir well; cook for a few minutes until the mixture thickens. Remove pork mixture from the pan and place in a bowl to cool. Set aside until ready to use. Place the sugar and warm water in a bowl; mix until sugar dissolves. Add yeast and leave it for 10-15 minutes until it blooms. Sift flour into a large bowl. Add yeast mixture, egg, oil and salt; stir to mix. Use your hands to bring the flour mixture together. Place dough on a lightly floured surface and knead for 10 minutes or until smooth and slightly elastic. Place in a lightly oiled bowl; cover with a damp cloth and leave to rise until doubled in size, approximately 1 to 2 hours depending on room temperature. 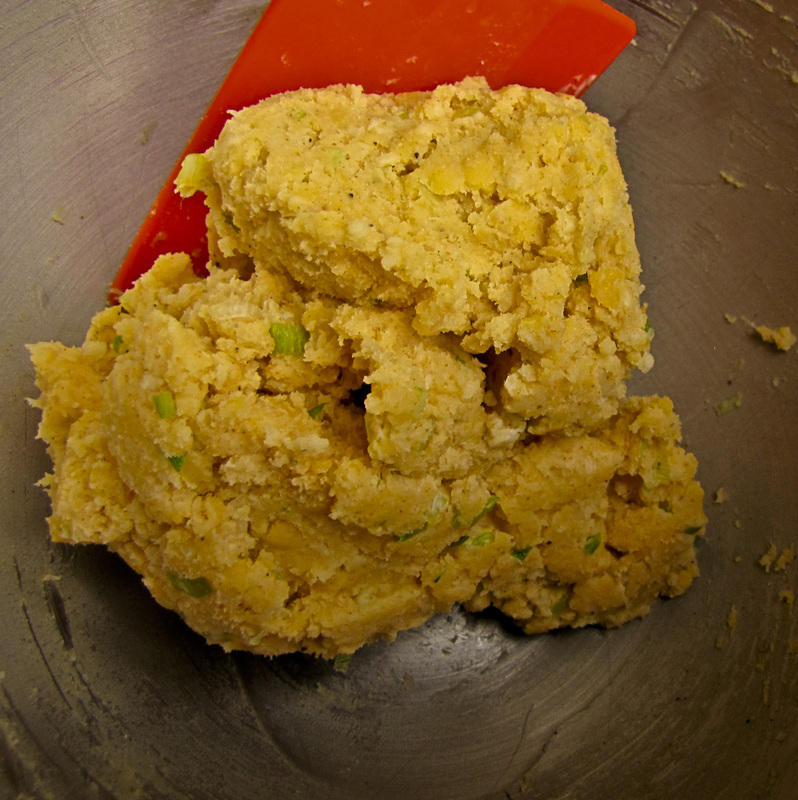 Once dough has doubled in size, punch down and divide into 12 portions; shape into round balls. Use a rolling pin to roll a ball into a 2-inch disk. Then pick up the piece of dough and gently pull the edges to enlarge to a 3-inch diameter disk. The dough will be slightly thicker in the center. Place a heaping tablespoon of filling on the dough circle. Gather the edges and seal the bun. Place the bun, seal side down, on the baking sheet. Continue with the rest of the dough. Once all buns are complete, brush surface with egg wash.
Place in a preheated oven of 390 F for 15 minutes or until golden brown. Typically CreativeLive workshops are broadcast during the working day, with a full repeat shown each evening. This isn't a commercial, just an enthusiastic suggestion that you check into this offering. I've enjoyed and benefitted from two previous CreativeLive workshops and can't wait for this one. Here's the LINK for more information and an easy enrollment process. Just in cast that link doesn't get you there, here's the URL all spelled out. Our table yesterday at Alki Beach's Cactus Restaurant was under bright, indoor lighting and I used the iPhone's Auto settings all the way. I've stalled in the easy zone of iPhone photography, just taking quick snapshots, so it's time to break out and shoot with more courage. Thoughtful courage? Here's a baseline sample of my before shots... before the iPhoneography workshop. Some after shots will show up later on in January. What a perfect excuse to revisit Cactus. Dragon's Breath Chili is the actual title, but this chili deserves a string of superlatives like dynamite, awesome, over-the-top-delicious, swoon-worthy... OK, now I'm getting carried away. This all began with a great chili recipe I found online at the FoodNetwork site. Not every In the Galley post features an original recipe let alone an original idea, and that's the case today. I was content to follow the lead of talented cooks, and work with the ingredients in my pantry. 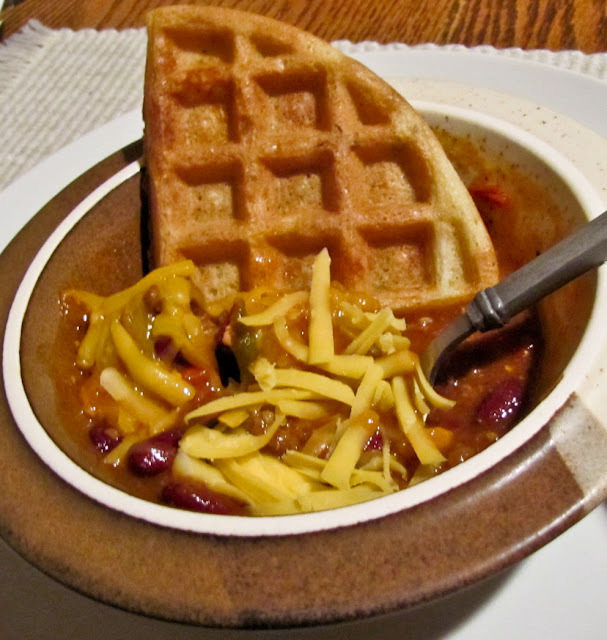 Chili and Spicy Cornbread Waffles sounded like an inspired combination, two stand-alone taste treats that could pair up to deliver more than double the punch as a combo. This duo added a welcome and tasty heat to a chilly December evening. There's no shortage of chili recipes around here, not likely with dozens of delicious chili variations filed away on my computer. 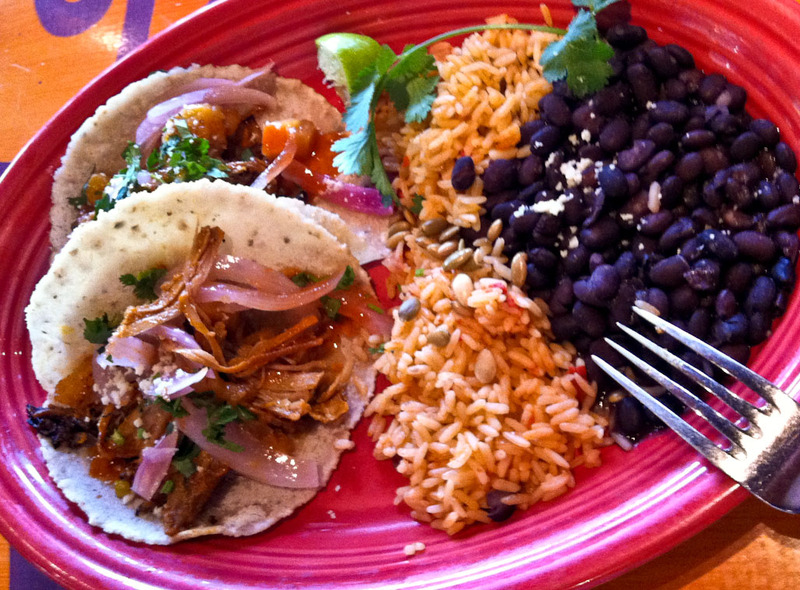 Would you prefer beef, pork, chicken or lamb chili? 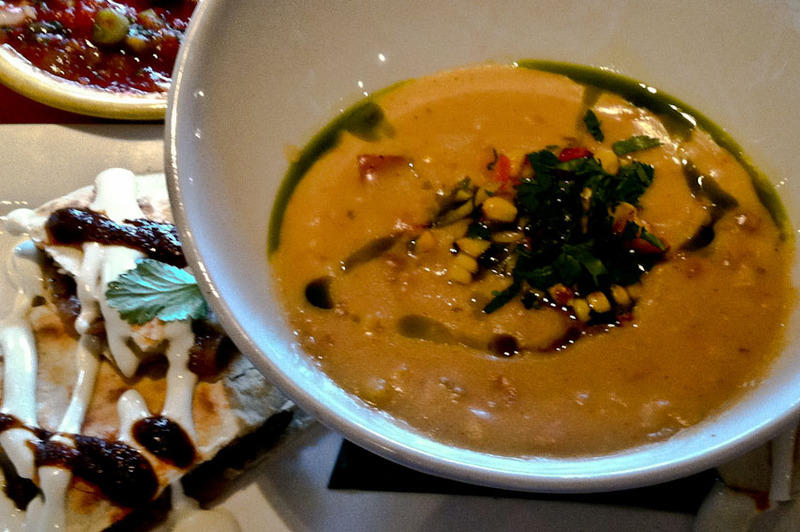 Red chili or green chili? Chili with black, red, pink or white beans? Chili with no beans at all? Perhaps chili-sauced beans with no meat? We keep taste testing new versions, one batch after another, searching for the ultimate, best-ever, blow-me-away chili recipe. We may have found it this time. I know I've said this before, so I'd better reserve final opinion. Four of us made a serious dent in a huge batch of Guy Fieri's Dragon's Breath Chili and everyone gave it two thumbs up on taste. I've noted my tweaks, but recommend the original recipe as a keeper, even though it calls for over 25 ingredients! I added 1 diced poblano, a handful of grated pepper jack cheese, a handful of chopped pecans, 1/2 cup water, 1/4 cup cornmeal and 1/2 cup AP flour to my usual sourdough waffle blend (link -minus the almond extract of course). What was I thinking?!? While not a disaster, these waffles were too close to ordinary in taste. Next time I'll forget the sourdough approach and stick to a standard cheesy jalapeno cornbread recipe with the added punch of cayenne or chipotle. 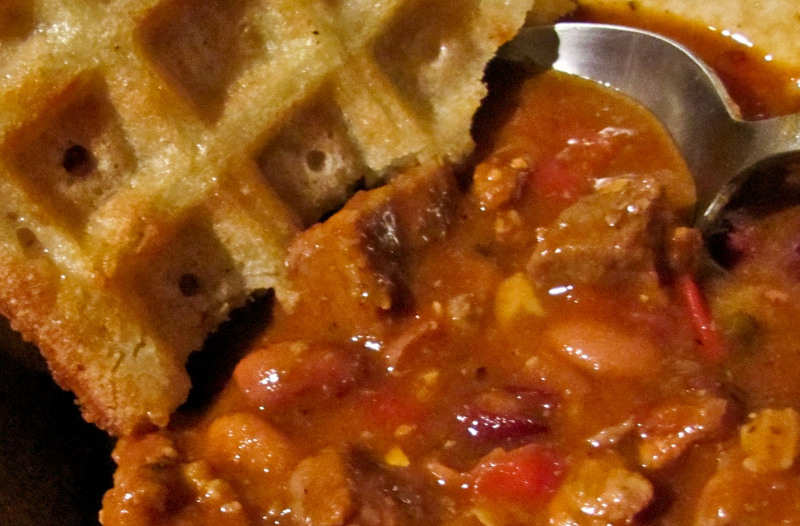 The chili's zippy yet mellow taste made up for any missing hint of corn in the waffles. ...and how about the Hardrock Cafe's Jalapeno Cornbread Waffle with Sauteed Garlic Prawns in Poblano Chili Cream? Oh my, there's a temptation for another day. In a large, heavy-bottomed stock pot cook the bacon till nearly crisp; remove from the pot and set aside. Add butter to the bacon grease and melt over high heat. Add garlic and saute a minute longer. Remove the vegetables from the pot with a slotted spoon and set aside in a bowl. Add chuck to the pan in batches and lightly brown. Set aside to add back in after all meat is browned. Add ground beef, turkey and sausages to brown and stir gently, trying not to break up the ground meat too much. Cook until meat is nicely browned and cooked through, about 7 to10 minutes. Return the browned chuck and vegetables to the pot. Add in granulated onions, granulated garlic, chili powder, paprika, cumin, coriander, cayenne, salt and pepper and cook for 1 minute. Add in tomato sauce and paste and stir for 2 minutes. Stir in beer and chicken stock. Add beans, lower heat and simmer for 2-3 hours, until meat is tender. Taste for seasonings and adjust as needed. Use a cornstarch or masa slurry to thicken the chili, as needed, according to your preference. Following a week of Thanksgiving indulgence, you might think dinner would feature a small salad or light soup. No way, not tonight, I really craved pasta. Convinced that portion control would trump calorie count, I foraged around in the kitchen seeking inspiration. Which sauce would offer the most flavor in the least amount of time? Fettuccine al Limone is always a favorite, but cans of oil-packed Italian tuna called out "choose me, choose me." Okay, tonight's choice would be Pasta with Tuna Sauce. 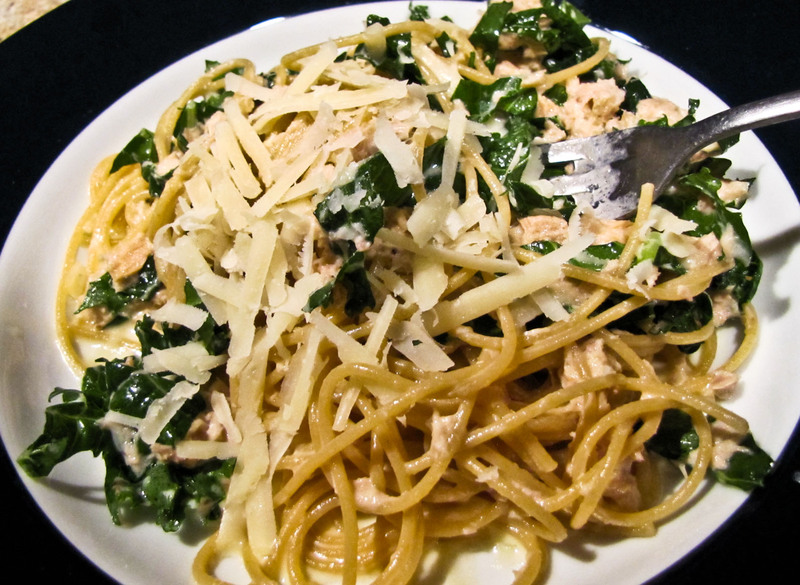 Pasta, coated with a creamy, garlicky sauce featuring tuna, butter, Parmesan cheese and a handful of shredded kale, was the perfect dish to end a busy day. Some of the best pasta sauces are the simplest, featuring few ingredients and uncomplicated preparation. That said, it's important to have fresh and high quality ingredients like good cheese and solid, oil-packed tuna. I could almost taste this sauce before I scanned the refrigerator and cabinet shelves to check on the necessary ingredients. Long pasta - check! although it was whole wheat spaghetti, the kind RL refers to as strings of cardboard. Canned tuna in oil - check! two cans of the good Italian variety. 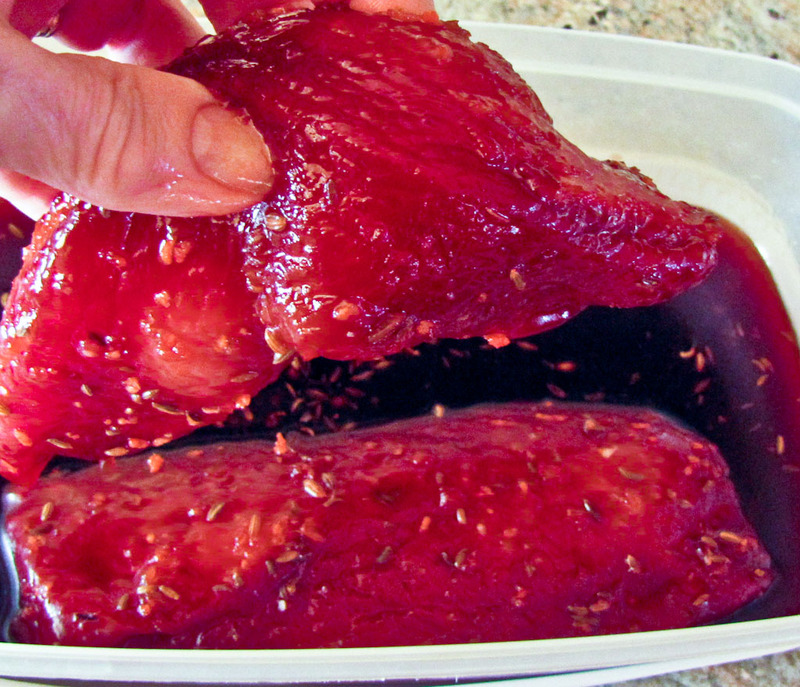 Don't even bother trying this recipe with tuna canned in water, it just doesn't work. Parmigiano reggiano - check! a big chunk fresh from the deli. I love those fat wedges with a thick rind, perfect for seasoning soups after I've sliced or grated off the good stuff. Heavy whipping cream - check! hey, what was that doing in my refrigerator? We're supposed to be eating healthy again. Kale was an emergency substitute for the usual Italian parsley, (sorry Marcella) but it's now become my go-to choice for this dish. The sauce went together quickly as the pasta cooked and the finished dish was on the table in no time at all. Most evenings we would have enjoyed a green salad alongside and fresh fruit for dessert. Tonight we dined on pasta, one modest portion apiece... and then went back for just one more small serving. Sigh. Tomorrow it's back to veggies, but tonight I loved that pasta. Fill a deep pot with water to cook the pasta. Salt the water and bring the pot to a rolling boil over high heat. Add the garlic, kale, egg, butter, warm cream, salt and pepper and the 1/2-cup of grated cheese. Use a fork to mix all the ingredients until well blended. It is important to break up the tuna chunks... really smoosh it. Adjust salt and pepper to taste. Cook the pasta until it is barely done, al dente. Drain the pasta, but not too well, reserving a cup of pasta water. Immediately add the drained pasta to the tuna mixture and toss. If the sauce is too heavy or stiff, add a few tablespoons of hot pasta water and toss some more. I sprinkle freshly toasted fresh breadcrumbs on top just before serving - we like the crunch. Serve at once, with additional grated cheese available on the side. *Buy the expensive stuff, packed in oil, it really does make a difference. Water packed just doesn't do it. 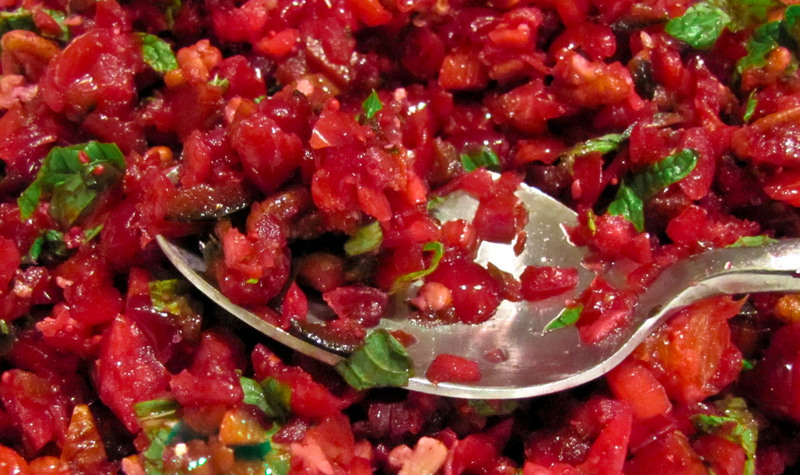 Not just for holiday dinners, enjoy this cranberry relish any time. Cranberry Relish a la Martha Stewart adds colorful zest to the traditional brown Thanksgiving dinner. Think about how many tables feature a browned beige bird surrounded by pale mashed potatoes, brown stuffing, brown gravy and pale beige rolls. 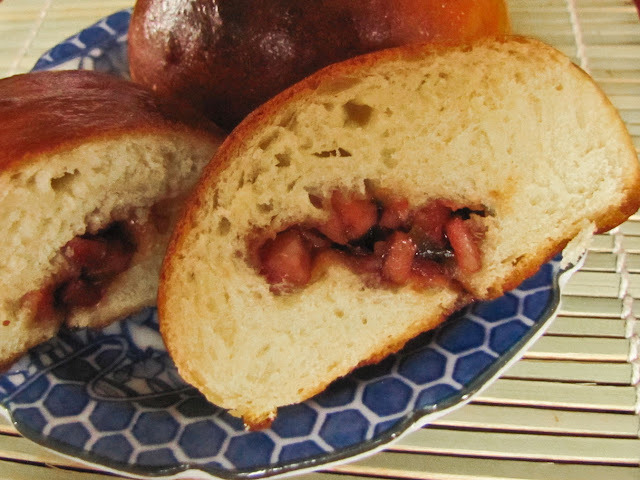 Cranberries look festive, but can disappoint flavorwise. 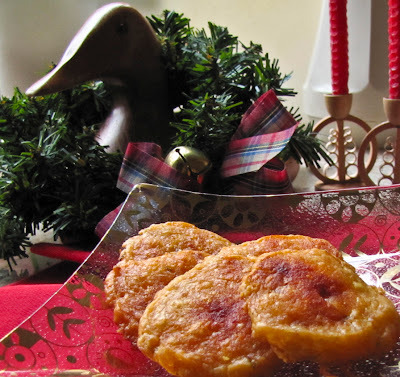 There is no disappointment with this recipe - Martha got it right! 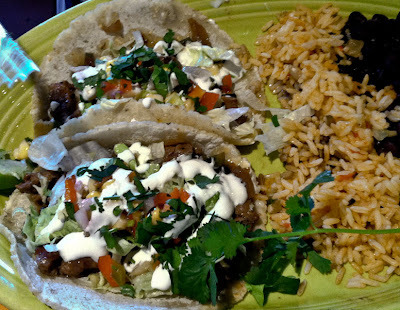 The bold flavors of onion, ginger, mint, jalapeno and citrus create an engaging fiesta for the tastebuds. The dish is somewhere between a condiment and a side dish, tasty however you use it. Serve it as an accompaniment to roast turkey or chicken, or pair it with pork, lamb or beef. It's a winner on turkey sandwiches or inside panini with turkey and havarti. Leftover relish is rarely a problem in my kitchen, it disappears quickly. (I nibble on spoonful after spoonful whenever I think about it.) Hmmmm, I could tweak the recipe and try canning a chutney-like version of the cranberry relish. No, this month I'll make batch after batch of the fresh recipe. 1. Place cranberries in food processor and pulse to chop coarsely, about 5 pulses. Transfer to a medium bowl. Do the same with half a red onion. 2. Add onion, jalapeno, lime juice, orange sections and juice, ginger, sugar, and celery. Mix gently. Refrigerate for at least 1 hour and up to 2 days. Just before serving, add mint and pecans and toss to combine. * Blood oranges give the relish GREAT color, but the flavor is the same with navel. **You can substitute fresh basil or cilantro, or even use bottled mint sauce, but fresh mint leaves work best. A small tasting plate apiece took care of any hunger pangs, but left a lot of chicken, potatoes and sauce in the pan to deal with. Reheating and re-serving was not a popular option. For one brief moment I even considered reheating and serving the leftovers over crispy waffles - wow, how's that for desperate?! Hash - aha! there's a solution that has worked before. 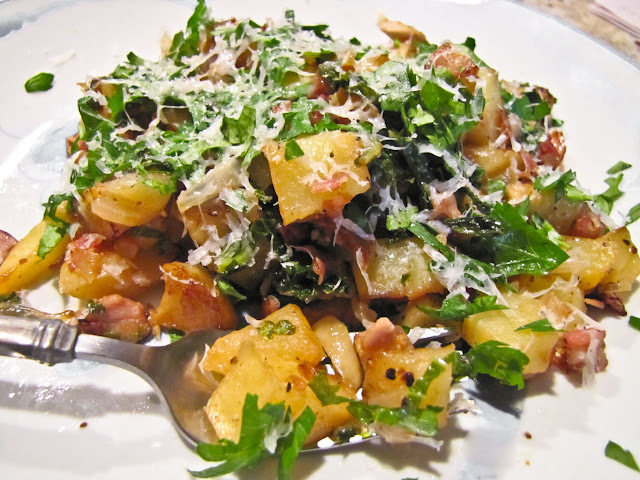 Hash proved a winner with the remaining Maple-Mustard Chicken and Potatoes. Added sauteed onion chunks, julienned kale and a few squirts of lemon juice provided a welcome balance to the cloying sweetness of the original dish. In the future I might tweak the BGSK recipe to suit our palate, or I might just move on. Whatever. It's guaranteed that I will add add a touch of mustard, vinegar and maple syrup to chicken hash again soon. Here's a link to the original recipe for Maple-Mustard Baked Chicken Thighs with Potato Wedges as posted by BGSK on Serious Eats. Give it a try and see what you think. Heat the oil in a large saute pan over medium heat. Add the diced onion and cook for a few minutes until softened, but not browned. Add the minced garlic and cook for another minute or two until fragrant. Add the diced chicken, potatoes, and kale. Stir gently to mix, then add the water and vinegar to the pan plus any leftover sauce* from the BGSK chicken. Cover the pan, lower the heat to medium low and cook until warmed throughout. Stir occasionally. When warmed throughout, remove the lid and cook until the hash begins to crisp up a bit. Add salt and pepper to taste. 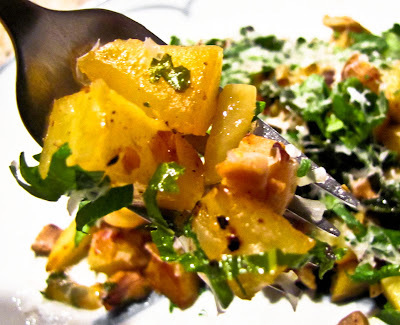 Top with parsley and a sprinkle of grated parmesan cheese and serve immediately. *If you don't have any cooked BGSK chicken, substitute deli chicken or any other cooked chicken and add a 1/8 cup of mixed cider, mustard, maple syrup and olive oil (proportioned to taste). Note: Diced poblano and red peppers would be tasty additions to this hash.